Leaves of the Trees: Two years ago. 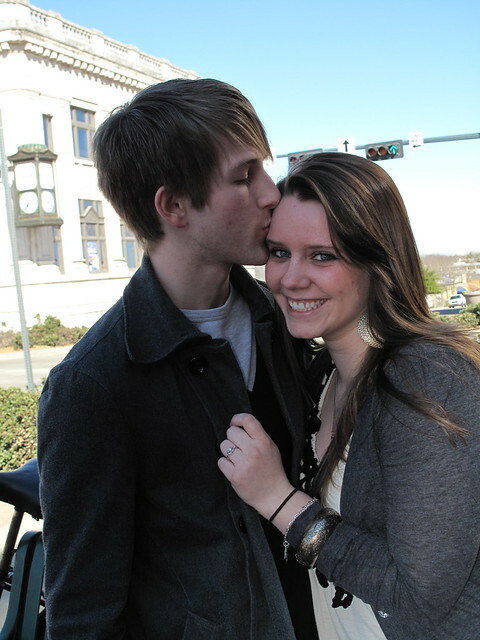 Kendall and I started living long distance when I moved to Denton for college Fall 2009. In February of 2010, Kendall finally had time to come visit me. I thought he was coming to meet my friends, but I had no idea of his true intentions. It was a weekend event, as we did many things we wouldn't normally do in a few short days. On Friday, we drove to Dallas to hang out for the day. It was a frigid day and I remember Kendall being miserably cold, but he stuck it out so we could walk around Mockingbird Station and go to the Human Body Exhibit. Saturday, February 27 is the day it happened. 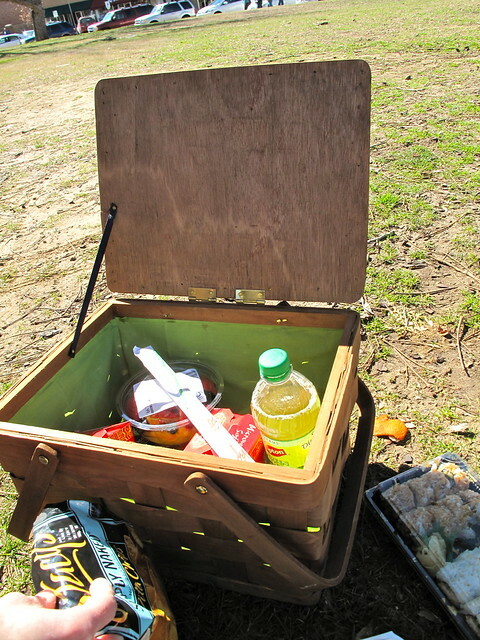 On friday, Kendall had asked me if there was a park we could go to the next day for lunch on a picnic. I suggested The Square because it is my favorite place to go. 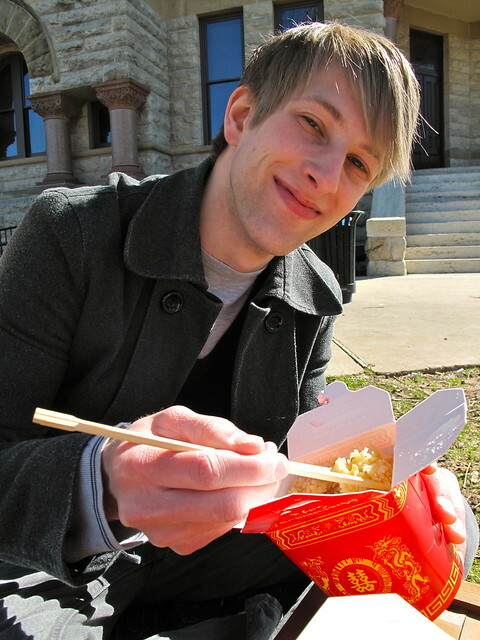 We went to Mr. Chopstix and got sushi and fried rice to-go. Our absolute favorite meal! We took it to the Square and sat underneath a tree by the Courthouse. It just happened to be warm out and a beautiful day, Kendall told me he was very thankful for that. We sat talking about anything and everything. All the while, I kept taking pictures since Kendall had just gotten me a Canon G10. He asked me to put the camera down for a bit and asked me why the Square was my favorite place. I told him I loved it because it was the perfect place to share Jesus with people. We talked about how good Father is for loving us and how great it was that we could love each other because He loved us first. I sat there with my head on his shoulder and I heard him say, "i've had an amazing time with you this weekend, but only one thing would make it better and that's if you would marry me." I looked down to see him holding a box open with a ring inside. I immidiately cried tears of joy-- I was so happy! Before I said yes, I asked him if he had asked my daddy. He said, "well not exactly. I just asked him if he would be my dad too." (that brought more tears. haha). Of course I said yes! We walked around the Square and ran into a photographer who took some pictures of us. It worked out so perfectly! We then spent the rest of the day telling everyone that I came into contact with. I was so giddy and most of the day was blur, but I was so excited. We got engaged and married under a tree. Trees are special to us. I am so glad to be able to say, that I'm finally his wife and have been for 9 months now. I love you Kendall Allen. I'm so thankful you asked me to be your wife, I couldn't imagine life without you. You are such a blessing and can't express to you how thankful I am that you are my lover and best friend. While the past two years have had their trials, struggles, and many happy times, I'm so glad to be by your side through it all. You are such a wonderful leader to our family and I can't wait to see where the Lord leads us....together. What a beautiful and unique engagement ring! I love it! Aww! Love your engagement story! So Sweet! Aw, so sweet! 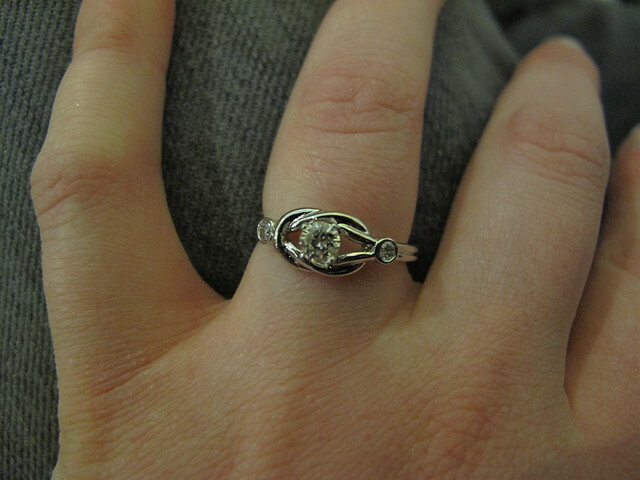 :) I love remembering the day we got engaged too...it also happens to be my birthday! :) You two make me smile! I love you and Ken so much - so great to see your story again. Love you guys! !